If you are like me, you have wondered about the biblical accounts of Creation. Some of it just seems so far fetched as to challenge the reasonability test. I've come to understand intelligent design vs evolution and science vs faith but I still felt something was missing in my understanding of Genesis. I recently bought/downloaded the movie below to try to address that. Dr. Del Tackett (the producer) is a pretty incredible guy. Presidential Advisor to college professor to movie maker, he was the author of Focus on the Family's The Truth Project - (we went through that together several years ago). It is still impacting my thoughts today. This new movie promises to be equally impactful. I am again struck by the importance of a reference point in interpreting what you see around you. We often have the wrong reference point set up in our minds. It's a little over an hour and a half but well worth your time. Check it out when you can and let me know what strikes you about it. Use Integrity97 at the password prompt. Do you have a regular quiet time with God? As I was preparing for Men's Group tonight, it occurred to me that I could give this greater exposure by posting it here. We are currently discussing how to take care of your soul - how to maintain your relationship with the God you love. This is not something that happens casually, you must make an effort to pursue Him. Just as your relationship with your wife will die over time if not maintained, so too will your relationship with Jesus die unless you take care of it. Do you have a regular time with God? I'm not talking a few minutes while you drive to work or a few minutes as you're on the "john" - I'm talking dedicated time reading and "being" with God. There really is no shortcut and no other way - you need to spend time to get to know Him. What follows is from Pat Morley of Man in the Mirror. I hope it gives you a little perspective as to what "time with God" looks like. Male friends - are yours "for real" ? The Bible has a lot to say about friendship. We could even argue that friendship is one of the Bible’s major themes—the Bible is the Book of Friendship! God existed from all eternity in the friendship of the Trinity, Father, Son, and Holy Spirit, enjoying a perfect, unbroken relationship with one another.God created human beings to enter into that existing friendship, to enjoy what God already enjoyed in himself. Creator invited creature to participate in something beyond wonderful. Tragically, we rebelled against God and, through our betrayal, ruptured that friendship. We walked away and were content to exist on our own, severed from God. But God is a good friend—the kind who initiates reconciliation even though he is the innocent party. To do this, he sent his Son, Jesus, into the world to be a friend to sinners, to defeat the sin that separated them and draw them back into relationship with the Father. And now, by putting our faith in Jesus Christ, we are restored to what we once enjoyed. Though we cannot now see God face to face, we wait with eager anticipation for the day Christ returns and restores to us all of the intimacy we once experienced. We will be forever with God, forever his friends. The friendship we experience with God provides the model for the friendships we can and should experience with other human beings. The intimacy God calls us to enjoy with others is not based merely on common interests or shared experiences. It looks beyond gender and color or any other easy division. It is a truly spiritual friendship in which we are bound together by God, in God, and for God. Because it is a spiritual friendship, it will exist beyond this earth and beyond the grave. It will endure forever. Friendship is a great gift of God. Spiritual friendship, friendship shared in Christ, is an even greater gift. Spiritual friendship with other godly men is one of life’s greatest privileges and highest joys. Do you have a close friend? Are you a close friend to another man? You need friends for the sake of your well-being. In recent years biblical commentators have looked with suspicion on the relationship of David and Jonathan. Some have read David’s lament upon Jonathan’s death and imagined them as a secretly gay couple: “I am distressed for you, my brother Jonathan; very pleasant have you been to me; your love to me was extraordinary, surpassing the love of women” (2 Samuel 1:26). But David is not weeping for a lover who shared his bed, but a friend who shared his life. “A friend loves at all times, and a brother is born for adversity” (17:17). Through the turmoil of constant betrayal, multiple marriages, and running for his life, David could always count on his friend Jonathan. Theirs was the truest and deepest kind of friendship that endured every kind of adversity. Who loves you at all times and is at your side during hardships? You also need spiritual friendships for the sake of your soul. You are a sinful person who can hold tight to your depravity. You are a weak-eyed person who often cannot see yourself as you are. You are a selfish person who sometimes struggles to live for anyone or anything apart from yourself. You need friends who will help you, serve you, strengthen you, equip you. You need friends to temper your weakness, to challenge your sinfulness, to comfort your sorrows, to speak truth into your tragedies. “Iron sharpens iron,” says Solomon, “and one man sharpens another” (Proverbs 27:17). Who sharpens you? Who is sharpened by you? Having looked at the beauty and necessity of friendships, let’s consider some ways to practically apply this in our lives. Examine your friendships.Not all friendships are helpful because not all friendships are truly spiritual. Wise old Solomon commends good friends and warns against foolish friends when he says, “Whoever walks with the wise becomes wise, but the companion of fools will suffer harm” (Proverbs 13:20). This does not mean that we cannot enjoy friendships with non-Christians. But many Christian men spend all of their time with those who don’t know Christ and rob their own soul of the benefits of a spiritual friendship. Examine your friendships to ensure you have friends who are wise and that you are not spending inordinate amounts of time with fools. While you may be able to influence them for good, it is just as likely they will influence you for evil. Pray for friendships. Ask God to grant you friendships. This is a good and noble request to make of the God who is your friend. Find a friend. The main factor that keeps us from friendship is our pride. We are ashamed to initiate friendships, afraid to look desperate or pathetic as we ask another man for some of his time. Don’t be dumb. Don’t deny yourself something so good simply because you are too proud to seek it. Many men are just like you—desperate for a friend, yet too proud to ask. Man up and go find a friend. Be a good friend. A friendship, like any other relationship, requires effort—effort that is usually measured in time. Friendships thrive where they are given sufficient time and they wither where they are not. Consider opportunities for face-to-face time (sitting together over coffee or another beverage) and side-by-side time (working together on a project or enjoying a hobby or activity together). Your relationship will grow in different ways in each context. Of all the gifts God gives, few are more precious than friendship, an enduring, sacrificial commitment to another person. Yet of all the gifts God gives to men, few are more likely to be overlooked than this one. Still, the Bible assures us: “A man of many companions may come to ruin, but there is a friend who sticks closer than a brother” (Proverbs 18:24). Find that man in someone else, and be that man to him. If you are going to run to win, you need to foster your friendships. by Tim Challies, pastor at Grace Fellowship Church in Toronto, Ontario, popular blogger and co-founder of Cruciform Press. God says not only are you accepted; you're valuable. How much do you think you're worth? I'm not talking about your net worth; I'm talking about your self worth. Don't ever confuse your valuables with your value as a person. You can be rich or poor but it has nothing to do with your value as a person. 1 - It depends on what someone is willing to pay for it. How much is your house worth? Not as much as you think it is, and probably not as much as it was a year ago. Your house is worth what somebody is willing to pay for it. No more. How much is a baseball card worth? To some of you, it's worth nothing. To Matthew, my son, it's worth a lot of money. Some people are willing to pay $10,000 for a baseball card. How much is a piece of art worth? Whatever someone is willing to pay for it. 2 - It depends on who owned it in the past. Sometimes something is valuable because of who used to own it. For example, would a car owned by Elvis Presley be more valuable than a car you owned? Probably. Or, would a guitar be more valuable because it was owned by John Lennon? I read about a pair of stinky, smelly, worn out basketball shoes that sold for $7,000 at an auction because they happened to be owned by someone named Michael Jordan. You have been bought and paid for by Christ. You belong to Jesus. How much does that make you worth? Now ask yourself, ‘Who do I belong to?’ The Bible says you belong to God. God exchanged His own Son for you! The Cross proves your value. Jesus didn't die for junk. You are incredibly valuable. Nobody has ever paid a greater price than God paid for you. You are acceptable and you are valuable! One of my deepest desires is to know God well. Yet for every few steps I take towards Him, it seems I eventually get knocked back a few steps by the world. It does bother me but it won't discourage me - it's part of the process. I've been shown how good the Lord can be and because of that, my pursuit will never end. He is truly worth more than words can express. Reading is a great help in getting my mind to the right place to be able to receive Him. It is the reading of other peoples thoughts that can help to formulate my own. In this way I stand upon the shoulders of those that have gone before me. Often we think of ourselves as highly developed and so much smarter than those of previous times. We think that our technological wonders afford us a higher intelligence quotient. C.S. Lewis calls this "chronological snobbery". He also recommends fighting that mindset by including older books in your reading schedule - two older books for every one new one. I am starting to see the value in this as I try to take his advice. 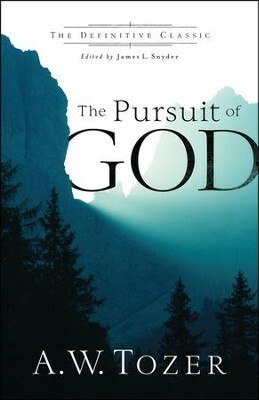 Attached is the classic "The Pursuit of God" by A.W. Tozer. I hope you take the time to read it in your quiet times and reflect upon how incredibly blessed we are to be able to comprehend even a small piece of our amazing God. It is really cool how guiding our subconscious can be so powerful in the practical aspects of our day to day lives. Creating a word, phrase, verse or statement can help keep you on track for desired changes. Do you have a purpose statement? One that describes what you are about? It can create a vision for your future and provide needed guideposts for today. One aspect of it might even describe how you want to be remembered when you are gone. Each day could then be a time of working towards your own legacy. How about a scripture verse that speaks to you right now? God often uses His Word to speak to us - it may be that He is telling you to pay more attention to something. Should that verse be your mantra for 2018? A more succinct version of the above might even be captured in one word. I like that - short and to the point. The oneword365 website (link below) describes how to come up with your own word. I am intrigued by this - thought some of you might be as well. The new year is coming - how will you use it?
" I pray that out of his glorious riches he may strengthen you with power through his Spirit in your inner being,.."
The power of Christ, through faith, powers us in our daily life. It enables us to know God and for God to know us. While Christianity is very much a group endeavor, enabling the Spirit is very much a one-on-one activity. It is the knowing of your God within yourself than enables you to love the unlovable and endure the unundurable. It allows you to stand on your own, knowing that God is enough, Jesus is enough and the Spirit is enough. What else could you ever ask for? I was struck this morning with the Men of Integrity devotion which speaks to this divine relationship. It follows below. Not only does the Holy Spirit increase our capacity to experience and enjoy God, he also increases our ability to connect with God. We have to realize that the Holy Spirit is God's actual Spirit. The spirit is that central and eternal part of ourselves that is our core essence. It is our mind and its understanding, our heart and its feeling. And God has shared that part of himself with us. What a mystery! What a treasure! The Holy Spirit connects us with the mind of God. In fact, Paul became so bold and pointed in his explanation of how the Holy Spirit connects us to God's mind that he said, "We have the mind of Christ" (1 Cor. 2:16). The same mind that allowed Jesus to live in perfect relationship with the Father dwells within us. We can connect with God as Jesus did through the Spirit. What a reversal of absence. We were once shut out from God but now can know his Spirit. We were once cut off from God, but now he can live within us. We used to not know God at all, but now we have his very mind. The presence of God through his Spirit is an astounding mystery—a mystery we will never stop uncovering throughout our entire lives. There is no magic in all of this - you just need a deep desire to know God and the peace He gives. If this is your time to respond to His call, just ask Him to lead you toward Him. God assures us that the prayers of an earnest man do not go unheard. "Do not conform to the pattern of this world, but be transformed by the renewing of your mind. Then you will be able to test and approve what God’s will is—his good, pleasing and perfect will." This verse describes so well my transition from the "world" to the Kingdom. My eyes were finally opened to the fact that God was acting in the world and that there was actually somewhat of an alternate reality existing in parallel with my previous life. It was very much like the scene in the Wizard of Oz where Dorothy opens the front door of her house (in black and white) and sees the outside world in living color - everything was alive and active as opposed to dull and monotonous. God's word will change your perspective on everything. You may have been living inside a bubble where your limits are defined and you can't see past tomorrow. You might think there is no reason, no hope. Everyone you know lives the same life as you and you have come to accept that, very likely, this is it. There is nothing else for you. You just resign yourself to the same old, same old and trudge toward your eventual death. What an existence. Is that living? God loves you as his own and wants more than anything for you to see what He has done for you. He wants to open your horizons, give you an adventure to live and a purpose to pursue. He wants to give you freedom from your past, present and future by revealing His perfect will for your life. Is it time for you to try something different? Let His word transform you and your life - you will never look back!